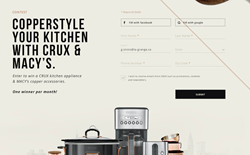 CRUX Kitchen products will anchor “copperstyle” sweepstakes, highlighting retail partnership with Macy’s. Sensio Inc., the specialty kitchen appliance manufacturer, today announced the launch of its “Copperstyle Your Kitchen” sweepstakes as part of CRUX Kitchen’s fall consumer campaign with Macy’s. “Copperstyle Your Kitchen” invites consumers to elevate the style of everyday kitchen essentials with CRUX Kitchen’s line of sleek, stainless steel and black stainless steel appliances with copper-line accents, complemented by a variety of “copperstyle” accessories available at Macy’s. Coinciding with the relaunch of cruxkitchen.com, the contest will live on a dedicated landing page that doubles as an interactive digital look book, featuring images, videos, recipes and links to shop at Macy’s.com. The contest also coincides with the addition of nine new products to the CRUX Kitchen line – including the CRUX Coffee Grinder, CRUX 5 Cup Coffee Maker, CRUX Programmable Slow Cooker, and CRUX 2.2 Pound Touchscreen Air Convection Fryer, and the CRUX 20-Cup Fuzzy Logic Rice Cooker, CRUX Sous Vide Cooker, CRUX Panini Grill, CRUX 3-Cup Mini Chopper and CRUX 6QT Extra Deep Electric Skillet, available in October. “We’re thrilled to bring the Copperstyle Your Kitchen campaign to life with CRUX Kitchen through a unique, digital experience,” says Maria Gagliardi, Sensio, Inc. Director of Brand Management. Each month, participants who enter the “Copperstyle Your Kitchen” sweepstakes will be eligible to win a bundle of copper-accented CRUX Kitchen appliances. The prize bundle for August and September will include the CRUX 14-Cup Programmable Coffee Maker, CRUX 2-Slice Toaster and CRUX 6QT Programmable Slow Cooker, valued at $219; the prize bundle for October and November will include the CRUX 2.2 Pound Touchscreen Air Convection Fryer, CRUX 3-Cup Mini Chopper and CRUX 7-Speed Blender, valued at $219. The sweepstakes will begin on Friday, August 11, 2017 and end on Thursday, November 30, 2017. Sensio Inc. will announce monthly winners on September 1, 2017; October 2, 2017, November 1, 2017; and December 1, 2017. To review the complete rules and regulations or to enter CRUX’s “Copperstyle Your Kitchen” sweepstakes, please visit: http://lookbook.cruxkitchen.com. Since its inception in 2003, Sensio Inc. has become a primary manufacturer of specialty kitchen appliances. The company is recognized for developing dynamic and innovative consumer products for their own brands including BELLA Housewares, CRUX Kitchen, brim and Throwback Appliance Company as well as other licensed brands. With a strong commitment to design, innovation, quality and function, Sensio Inc. offers a wide range of products from coffee makers and blenders to exciting entertaining amusement appliances such as free standing candy dispensers and popcorn makers, all of which are sold through major retailers nationwide. Sensio Inc. continues to conceptualize new and innovative ways to make everyday life in the kitchen easier. For more information, please visit: http://www.sensioinc.com. CRUX is the newest line of small electric appliances from Sensio, Inc. Designed and engineered in New York City, CRUX offers a dynamic, innovative and sophisticated collection of countertop cooking appliances, blender and coffeemakers featuring signature copper-line accents. The CRUX Promise ensures efficiency in the kitchen through smarter technology and quality products that yield only the best results. CRUX is available exclusively at Macy’s and Macys.com; to learn more, please visit: cruxkitchen.com or follow CRUX on Facebook, Instagram and Twitter.